I hope that everyone had a Merry Christmas and a Happy New Year! 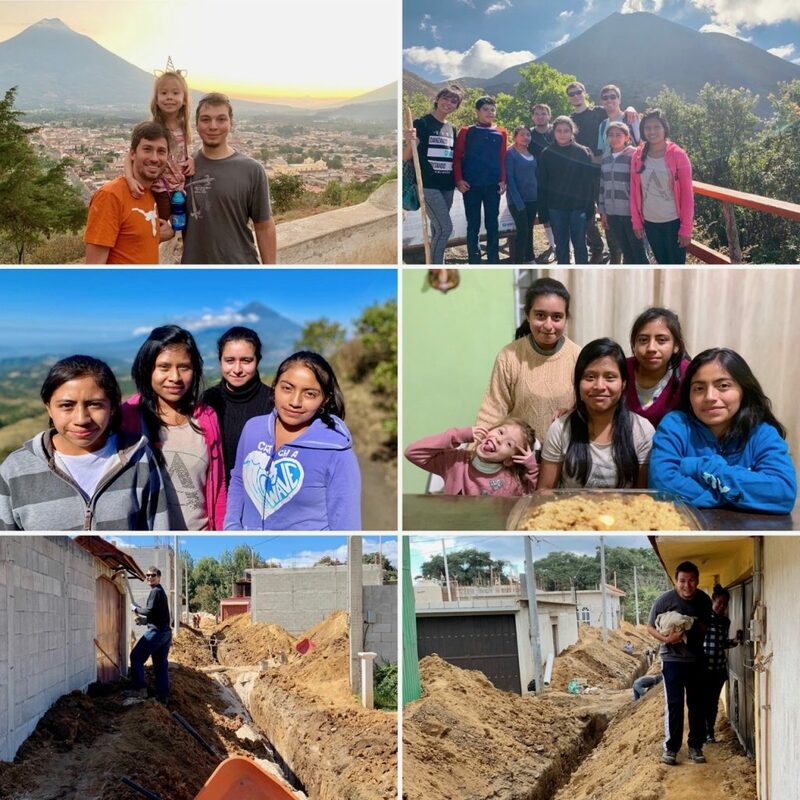 This newsletter is going out a little later than I planned, but here are some pictures from the activities and happenings here in Guatemala. We had a fun party with our Monday Night Bible Study group with piñatas, roasting hotdogs and marshmallows over a fire, and a movie. 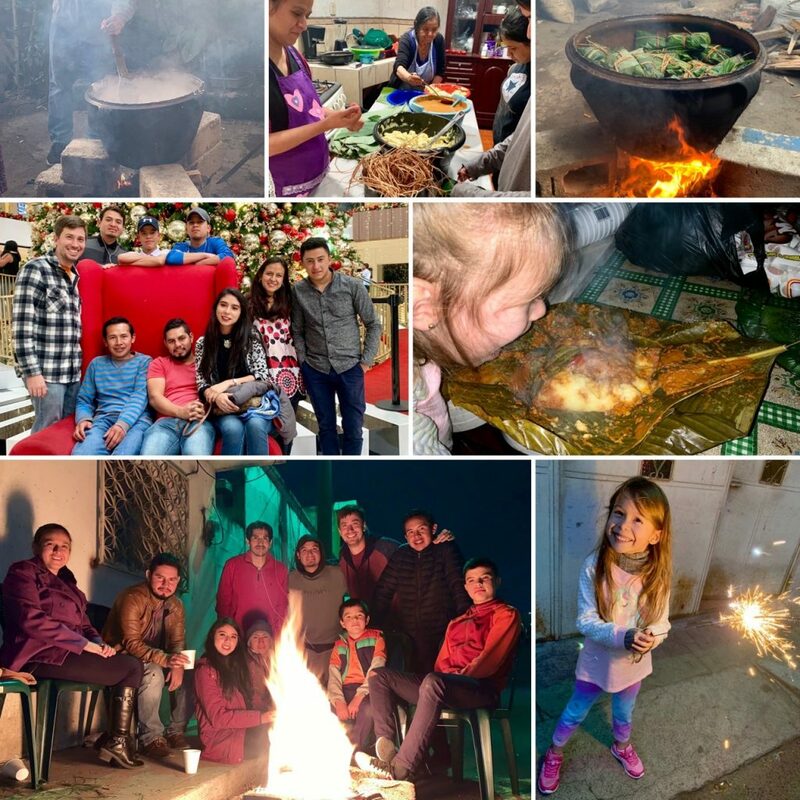 We served 150 typical Guatemalan holiday meals of tamales, bread and a fruit cider called “ponche”. A friend lent us some bounce houses for the children, and I shared about the true joy of the season. 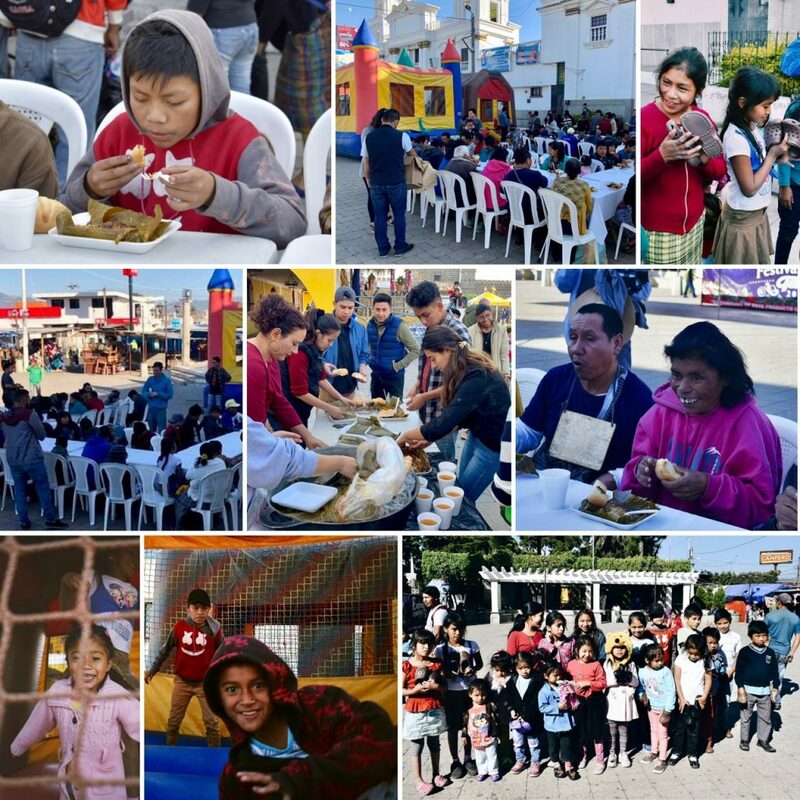 It was a great time to celebrate God’s love and provision throughout the year and to fellowship with the people in the park that we serve on a weekly basis. 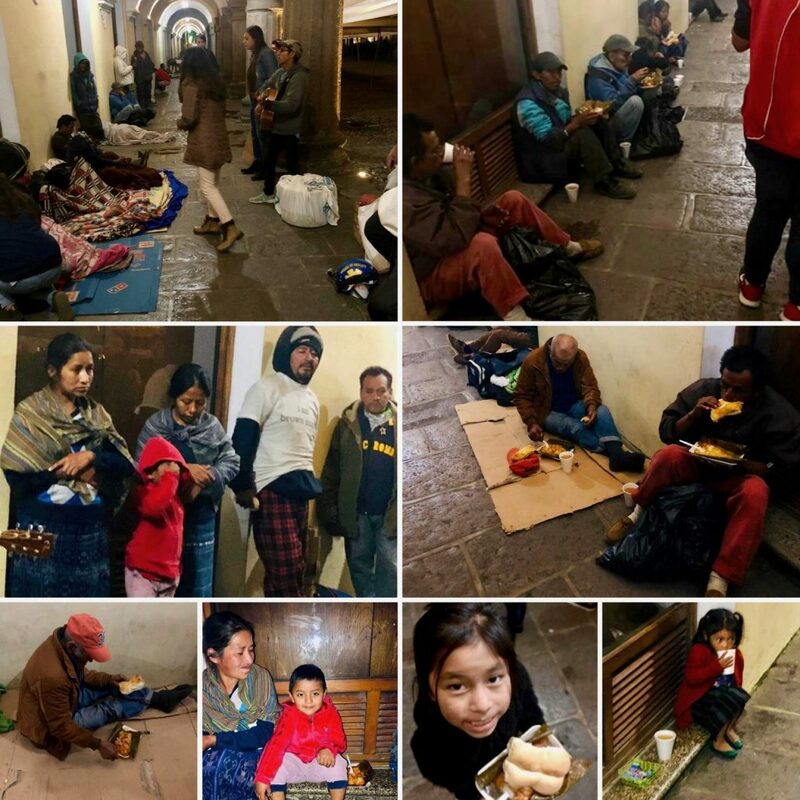 We took another 100 tamales the same night to Antigua, where there’s a large homeless population. We enjoyed spending time with the people, playing with the kids, praying for their needs and passing out the meals. Christmas in Guatemala starts early at 6 AM on the 24th as we begin making a huge pot of tamales. The process continues through the day until they’re ready in the evening. We spend the day with Yuliza’s family and invite all our current and previous children to join us. 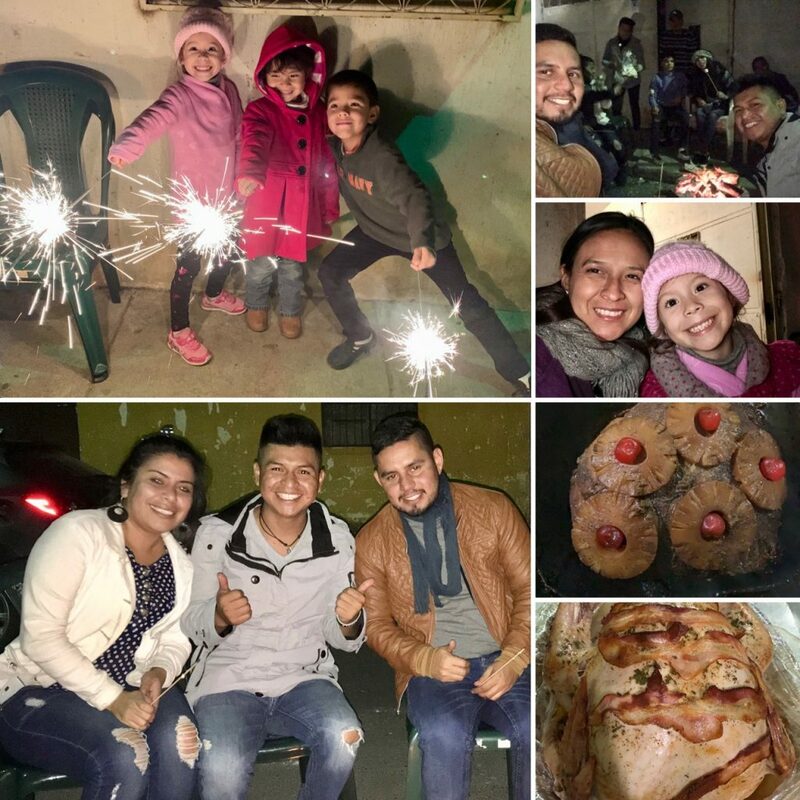 The main celebration begins at midnight Christmas morning with lots of fireworks, we eat the tamales, and then we make a bonfire in the street and enjoy goofing off, eating and spending time together. Margaret had a blast this year, staying up until 2 AM. Around 4 AM we crashed and slept late, and then went out to watch a movie together in the afternoon. We had hoped that Julio, Alfonso and Alejandro, who had lived with us before, would come and join us, but they didn’t make it. I was very excited to be able to see them, but we’ll keep trying to invite them over. 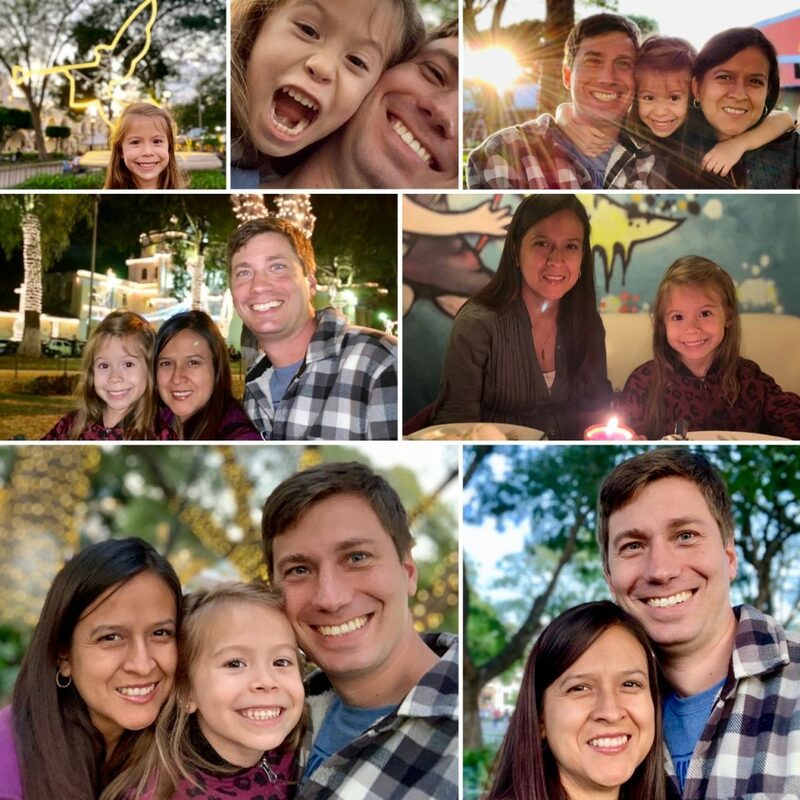 Yuliza & I celebrated our 9th wedding anniversary the day after Christmas, and we spent the afternoon in Antigua enjoying all the Christmas lights with Margaret. I’m so blessed to have such an incredible family, and we’re so excited to meet our new girl in April! We served 150 tamales with the children and workers of Casa Shalom. This is the Christian orphanage where Yuliza and I were working when we met each other 12 years ago, and we typically visit and spend time with the kids on a monthly basis. 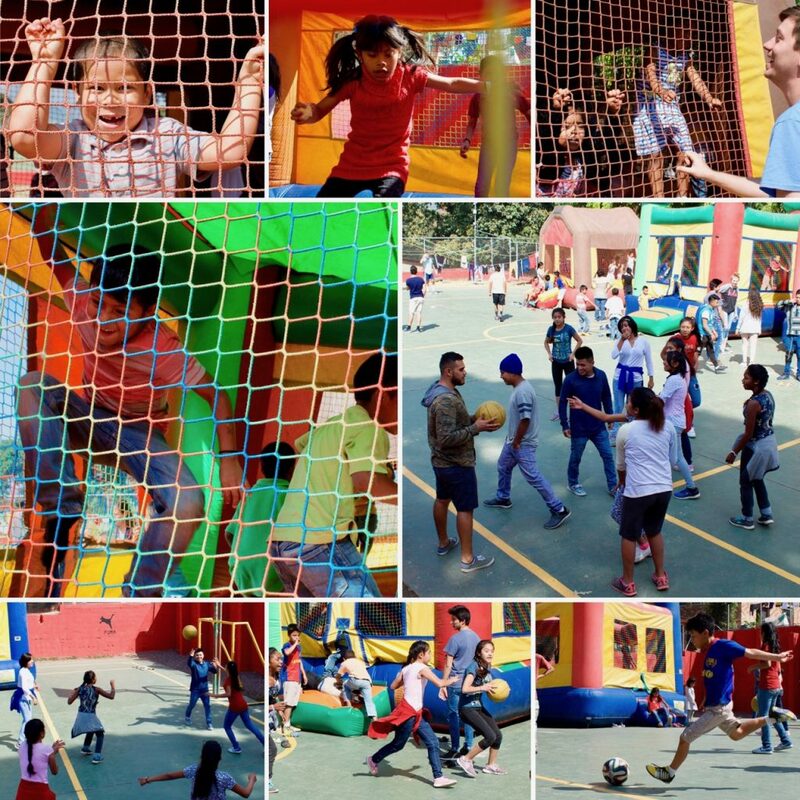 We brought bounce houses and played soccer and basketball with the kids and had a great time together! One part that really blessed my heart was that over half of the cost of all these Christmas activities was provided by the young adults who have lived with us over the years. Flora, a girl who lived with us and got married back in April, brought her new in-laws to see the orphanage where she grew up, and we had a good time getting to know them better. The New Years celebration here is quite similar to Christmas: lots of food, fireworks, and fun until the wee hours of the morning! We cooked a turkey and a ham and had a great time hanging out together. Edwin, Jenifer, Cesar and Carlos came to join us. My good friend Luke came from Austin to visit for two weeks in January and we had a great time hanging out, fishing, cooking lots of foods, and hiking a volcano. The girls are all now back in school. Celia is a Senior, Sandra is a Junior, Ana is a Sophomore, and Karla is in eighth grade. Margaret started kindergarten and is thrilled to be back with her friends. Sandra also just turned 21 and we enjoyed celebrating with her. And the road construction in our neighborhood started about 3 weeks ago to install sewer lines. They had to dig a trench over 15 feet deep in some parts, and they made it very difficult to walk down the street, as you can see in the pictures above. In the process, the water pipes were broken, so we didn’t have water for about two weeks. Luke had a busier time than planned helping dig us out! The progress is slow, but most of the holes are mostly filled in now, and the water was reconnected this week. Hopefully we’ll be able to get our car to the house soon! Thanks so much for your continued support and prayers over the years! 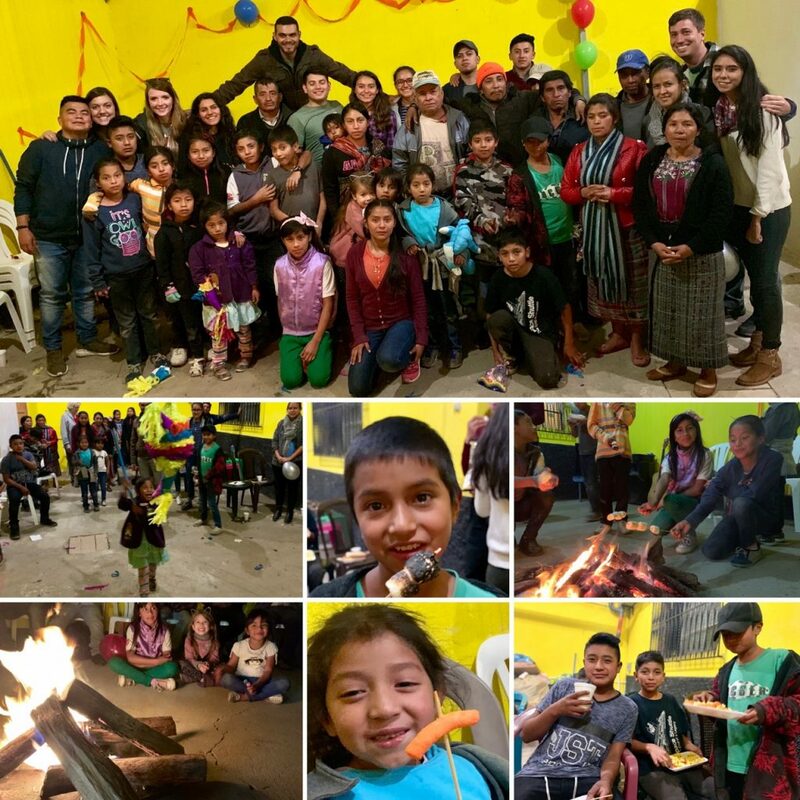 As we start another year, we’re so grateful and humbled to be able to serve here in Guatemala. We’re excited to meet our new baby girl in three months, and Margaret is so excited to soon be a big sister. She loves rubbing her mommy’s tummy and talking about possible names. We’re also proud of our girls and love to watch them grow up. Our prayer is that we consistently model their Heavenly Father and His incredible love for them. We pray that they grow to love and trust Him, and that they seek His will for their lives. His love has transformed my life, and has filled me with peace and hope. We’re going to be spending the next few weeks studying what the Bible shows us and teaches us about His love, and we’d appreciate your continued prayers for them.